Some of you may have received shiny new gadgets as presents during the holidays and may be wondering how best to protect them from the bumps and bruises of everyday use. The choices are extensive and may be sorted into three basic types: skins, covers, and cases. Over the years, we have found good ones in all the different categories. Cases offer the best protection (Otterbox, LifeProof) and are especially suitable for those who tend to drop their gadgets. Covers give scratch and bump protection, but may not protect a device from a fall. Skins are thin but the tradeoff is that they only help prevent scratches and are completely useless if the gadget goes flying. We use cases and covers on occassion, but have to say that skins are our preference. Gadget designers spent a lot effort to make the gadget svelt. It seems a shame to bulk it up with a case unnecessarily. For everyday use, we either go “commando” or protect the screen with a Zagg InvisibleShield. The only drawback to the InvisibleShield is that it can be a bit of a pain to apply properly. Dust, dirt, or air can be easily trapped under the skin during installation and removal is practically impossible. This is why we are so excited to tell you about DomeSkins. Some may remember the little DIY iPhone4 skin hack we did back in June. Well, you can now have a 3D Leica M9 iPhone 4 skin without having to do all that work! 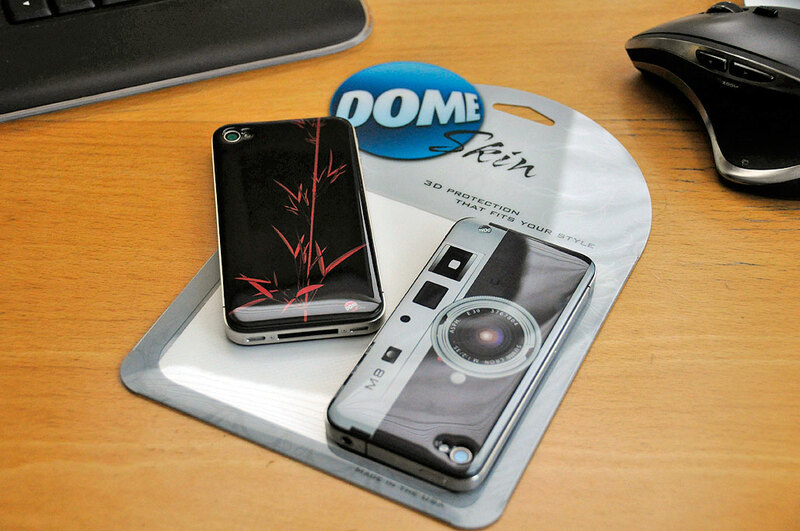 DomeSkins are made from a removable/reusable 3M plastic. They protect the device from scratches and improves the grippiness of the phone. Go here to check out all the different DomeSkin designs and patterns. Application of the DomeSkin could not be easier: just peel and apply. The easiest way to get the skin aligned is not to press down until it is exactly where you want it. We didn’t get the skin positioned just right over the camera lens. So all we had to do was to nudge it slightly until it was in place. However, even if the skin wouldn’t move for us, we could have just peeled it off and started over. The “DomeSkinned” phone is a little bit thicker, but a lot thinner than if we had put it inside a case. We definitely like the skin on the back, but are undecided about the front. The home button is now more recessed and is more difficult to press. The good thing is the front can be easily removed should we decide to go with just the back. 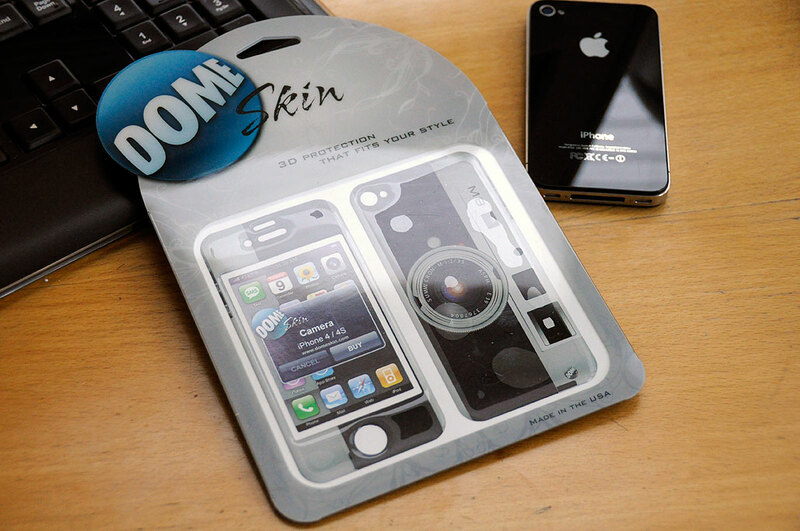 The one other design we would like DomeSkin to offer is a completely clear one. It would be great for those who are happy with the original look of a product, but still want to protect it from the occassional bump. We’ll be back in the Fall with an InTheWild report to let you know how the DomeSkin held up to our abuses 🙂 Happy New Year!! !